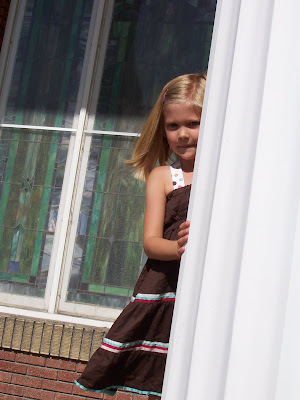 Brown Paper Packages: Twirly-Whirly Dress Showcase and GIVEAWAY!!! 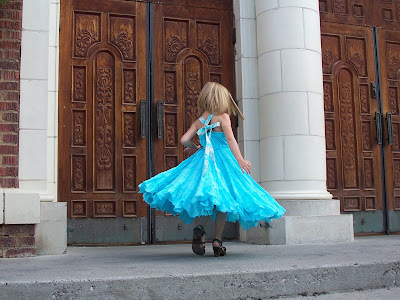 Twirly-Whirly Dress Showcase and GIVEAWAY!!! The giveaway is for the black dress only. It would fit probably about size 5 to maybe even a size 7 or 8. It is made from an upcycled women's skirt. To win, all you need to do is leave me a comment. If you want an extra chance to win, post about the giveaway on your blog and leave me another comment with a link. Want one more chance? Visit my Etsy store here and come back and leave another comment telling me your favorite vintage pattern. Giveaway will end next Sunday, Sept 30 at 12:00 noon. Good luck! 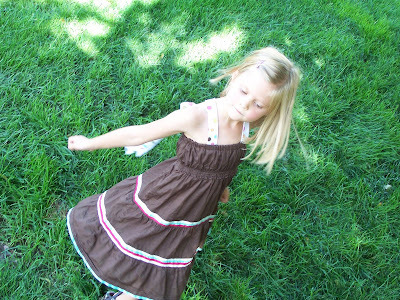 PS I may be selling the brown Twirly-Whirly Dress in my Etsy shop soon-- if you are interested! My favorite vintage pattern at your store is the: 1960s Squaredancing Centennial Costume! What FUN! Beautiful dresses! 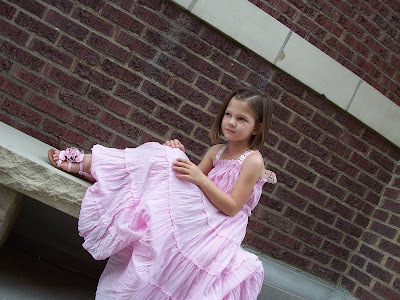 I have LOTS of tiered skirts, so I am sure I could spare a few to make dresses for my niece and my friends' daughters. 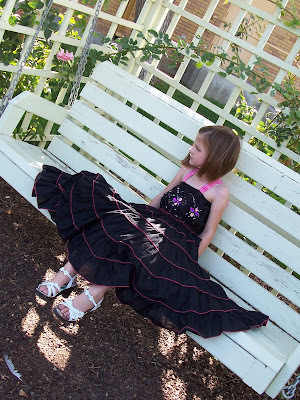 I would love to win the black twirly whirly dress for one of the sweet little girls in my life. You have so many charming vintage patterns! I love the 1960s Simple Sleeveless Dress Pattern Size 12 Simplicity 4429. It has the perfect timeless and classic silhouette. Also had a giggle at the fun wizard costume. That would be a fun gift to make for a friend of mine with whom I have a running wizard joke. I love love love the 1950's formal wiggle dress!!! It reminds me of Doris Day! I was so born in the wrong era (I'm only 30) but this pattern would be so fun! 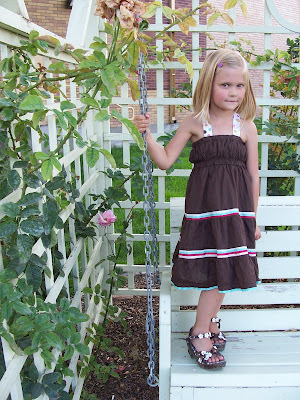 These dresses are amazingly cute! Can't wait for the tutorial! thanks for the chance to win--my daughter would just love it! Gorgeous dresses! My daughter has matter-of-factly told me that she HAS to have one. She's super-girly like that. My favorite at your shop has to be the 1960s Women's Collared Dress Full or Slim Skirt Size 16 McCalls 5251 UNCUT. If I was still a size 16, I'd so get it to make the Full Skirt version. It's gorgeous!! My favorite style of dress! I just love the dresses. They look amazing. Such a great way to upcycle clothing. Thanks for sharing. These are adorable. It's a great use of once trendy women's clothes. You're models are stunning little beauties! By the way, your photography is great. My mom is a photographer and she would love those shots. That is so gorgeous, my little girl won't be big enough for quite a few years but my cousin has a little girl the right size and I know she would give it back when they are finished with it. Umm I have the cutest nieces in the world!! Love those dresses! Save some for your future Hogan nieces! 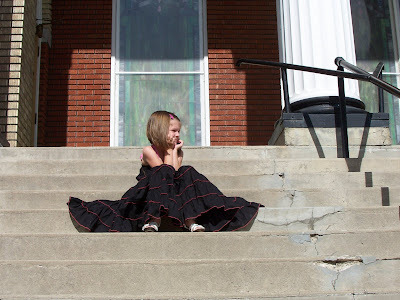 VERY cute way to upcycle a tiered skirt! Thanks for the tutorial & giveaway! In your etsy shop, I like McCalls 5251 -- It's just so classic! What a beautiful dress and wonderful tutorial! My daughter would love these! Thank you! Pick me please!! I love it! You are so talented. Where did you buy the womens skirts? My favorite pattern is 1960s Womens V-neck back Full Skirt Back Dress. Women just looked so elegant in this dress back than! What a great idea. 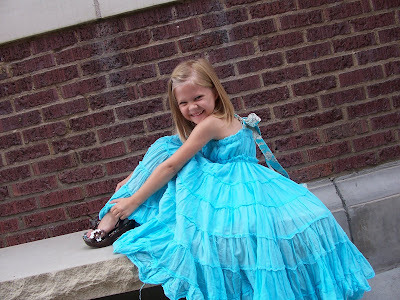 Your girls look adorable, and I know mine would love to twirl around in that dress! How fun. Ok Leisel, I did it! I am not quite sure how to make a link on my blog but I did put your site in for all to check out! Great sewing job and I love your tutorial...I will admit that elastic string scares me! I know I have said this many times but you are amazing! I love those dresses. I love it, great job! Enter me. Oooooo! I love! Will have another project to add to my ridiculously long list! Thank you from the bottom of my crafty heart! Cute! And you made this from an old skirt?! 1990s Skirt and Suit Top Womens Pattern Size 12,14,16 See and Sew 5768 UNCUT...mostly because I CAN'T believe it is actually from the 90s! Wow. Me want! Not for me of course, I'm one size too big for that dress but it would fit my neice perfectly! Thanks for letting me enter! Just visited your etsy shop! I love the Breakfast At Tiffany's look! I am so glad to have found you, I love your site. You are one talented lady, thank you for sharing with all of us. I have a feeling I will be spending a lot of time here, learning how to make things for my grandaughter. They are so cute and way to go on all of this. And you got your store up and going, go you!! Oh, I'm entering by the way! Where do you get all the cute shoes too? I have to say I do love the 1960s Girls Child Sleeveless Dress pattern. Never thought I'd like that style but it looks cute and you could change it up some. 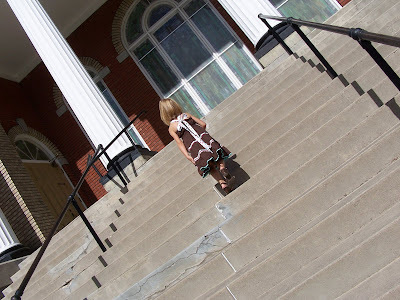 If I were a little girl, I'd be doing some serious twirling in that skirt. It's fabulous! I would love to have one of those beautiful dresses! Who doesn't love a big twirly skirt. I hope they are easy to make so that if I don't win, I can at least try and create one for my girls! You are so creative! Is a GORGEOUS pattern~ LOVE it!! These are amazing dresses!! My girls would LOVE them!! I am blogging about this giveaway!! Too cute!! Thanks for the chance to win, it would be adorable on my youngest. I wan to win so so bad that dress is amazing. I am so in awe at women with talent like yours! These dresses are so lovely! And what a great idea for upcycling. Thanks so much for the giveaway! I thought it was pretty wild that on this pattern, from the 50's, it lists a 32" bust and 25" waist as a size 12! I'd have to adjust the pattern up a few sizes...but it's so simple and pretty! This dress is just adorable!! I love it! These are SO adorable! 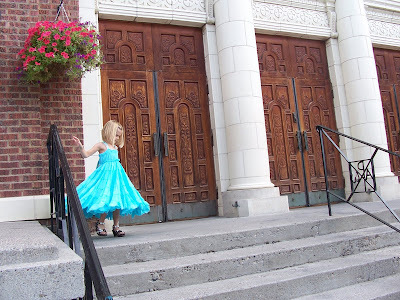 My daughter would love to twirl, and twirl, and twirl! I really like the dresses but especially the setting where you've done the photoshoot. I just posted about the giveaway. I used to own this pattern! "1990s Skirt and Suit Top Womens Pattern Size 12,14,16 See and Sew 5768 UNCUT"
my favorite pattern is 1970s Halter Top Palazzo Pants Vintage Pattern Simplicity 5355 Size 12 UNCUT. Love those big pants! Fantastic dresses. 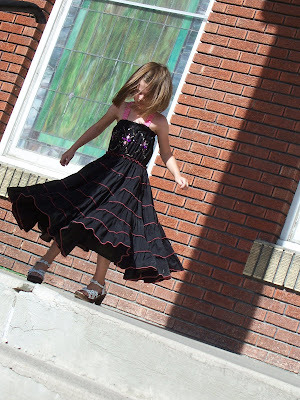 I have 2 little nieces who love to twirl and would love this dress. I'm going to have to see what I can upcycle for them from my closet. My 5 years daughetr would lov it!!!! I love BOGO1/2 Sale 1940s Three Piece Playsuit Pattern Skirt Midriff Top Simplicity 4321 UNCUT !!! I think you might be my new hero! You can pick up a refurbished 5GB unit in black, dark blue or orange for $62 and you can get a 6GB model in black, light blue or silver for $66. Thanks in no small part to the metal casing, the latest Yepp MP3 player commands a ton of respect with a sense of ruggedness that only a handful of competing players can offer in today's world of molded plastics. User-friendly radio with an AM/FM radio alarm clock, CD and MP3 player, bass reflex tube and full range speaker all in one.